Wonder how much does it takes to write a script to convert all HEX to Assembly Language code ? FIVE with help of Python and Capestone . 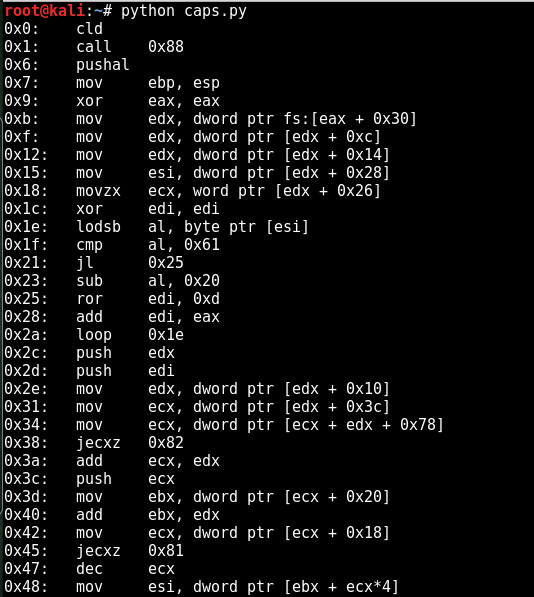 You might require dissembling HEX shellcode to Assembly in reverse engineering or exploit analysis or exploit development. There are other dissembling tools like Ollydbg or IDA Pro, but if you would like to use this small tool available as 5 lines of code, here it is how. First if you dont already have Capestone installed , accquire and install it. It is preinstalled on few pentesting distros like Kali Linux . Open terminal and install using the following command. The example is a hex format of reverse TCP shellcode developed from msfvenom. for i in md.disasm(shellcode, 0x00): disasm dissambles the hex, its arguments are shellcode and the starting address. print(“0x%x:\t%s\t%s” %(i.address, i.mnemonic, i.op_str)): Print out Address, Operation and Operand.